“To do that in my hometown wearing the name of my hometown across my chest, with friends and family in the stands, and waiting for that last strike hearing them chant, ‘Let’s go Dallas, clap, clap, clap-clap-clap,’ I’m getting goose bumps right now thinking about it,” he said. Braden was promoted to Double-A three days later, but he never lost his appreciation for his gritty hometown and blue-collar upbringing. Dallas Lee Braden was born on August 13, 1983, in Phoenix, Arizona. His mother, Jodie Atwood, wondered why her son wasn’t eating for the first two days of his life when doctors discovered he was born without a uvula, a small piece of tissue in the back of the throat. Atwood took her infant son west to Stockton, her mother's city of residence, so the boy could undergo emergency mouth surgery. Atwood put down roots in Stockton, and the single mother and son sometimes resided with Braden’s grandmother, Peggy Lindsey, who managed a motel, and sometimes lived in their own apartments. Baseball hooked Braden by age 4 when he first slipped on a glove given to him by a neighbor. As Braden’s arm showed promise and velocity beyond his years, Atwood moved to a different Stockton neighborhood so her son could join the Hoover Tyler Little League. “And sacrifices like that began very early on,” he said. Atwood by this time had started her own home-cleaning business, and she’d often hold her son out of school so he could help her clean an extra house or two. She’d always explain her reasoning for such decisions. As Braden reached working age, his mother agreed that he could forgo taking on a job if he continued working hard on the diamond. Braden excelled as a baseball player at Stockton’s Amos Alonzo Stagg High School, although his poor grades and truancy twice got him booted off the team.3 He was a senior en route to a 9-1 record when his mother awoke one morning complaining of a headache. He attended class and baseball practice that day, but she wasn’t there to pick him up. A friend’s mother took him to the hospital, where devastating news awaited. Atwood underwent chemotherapy treatments, but they did little good. She died on May 20, 2001, just a few months after her diagnosis, with peace that her son was about to fulfill her dream by completing high school. The loss of the woman Braden called his best friend was devastating. “You talk about the rock or a guiding light in every sense of the word, in every possible embodiment, that was her,” Braden said. Two weeks after his mother’s death, the Atlanta Braves selected Braden in the 46th round of the 2001 amateur draft. But at 5-feet-9 and 140 pounds “soaking wet in a cotton uniform,” he didn’t think he was ready for the pros. Braden turned to Grandma Peggy, who was always there to provide support and guidance. The pair drove north to American River College in Sacramento to ask if the school was holding tryouts. When head coach Kevin Higgins told them the roster was pretty much set, Lindsey piped in that her grandson had been drafted by the Atlanta Braves and was a left-handed pitcher. “That’s when he perks up,” Braden recalled. Moving from the streets of Stockton to the Bible Belt was quite a culture shock for Braden, who had always played with a “me against the world” chip on his shoulder. He said that in Stockton he learned to avoid looking at others, and he now had to find a way to accept people for who they were. The Oakland Athletics selected Braden — now 6-foot-1, 185 pounds — in the 24th round of the 2004 amateur draft. He signed and reported to Vancouver, posting a 2-0 record in a relief role for the Canadians before heading east to start for the Kane County Cougars. The lefty was throwing an 88-92 mph fastball at the time with a straight change and a screwball. Braden began the 2005 season in Stockton, compiling a 6-0 record for his hometown Ports and occasionally fanning the “beer batter” before his promotion to Double-A Midland. He posted a 9-5 record for the RockHounds, but lingering arm troubles forced him to undergo shoulder surgery during the 2005-2006 offseason. Braden began the 2006 season on a rehab assignment before returning to Stockton for three starts (2-0) and Midland for one. The 2007 season was poised to be Braden’s breakout season after he posted a sub-1.00 ERA during winter ball. “I go through spring training, and they’re telling me, ‘You’re going to be our guy in Triple-A and when the phone rings you’re the first one on the plane,’” Braden said. But the plan went awry just days before the Athletics broke camp. The Washington Nationals released Braden’s friend Colby Lewis, and the A’s signed the right-hander and gave him Braden’s promised spot in Triple A. A dejected Braden headed back to Midland, but two starts later he got the bump to Sacramento. When Oakland’s Rich Harden landed on the 15-day disabled list with a strained left hamstring, the A’s called up Braden to start an April 24, 2007, road game at Camden Yards in Baltimore. The 23-year-old rookie “couldn’t feel anything” but tossed six innings of three-hit ball to lead the A’s to a 4-2 win over the Baltimore Orioles. It was Braden’s only win of the season, as he finished with a 1-8 record and a 6.72 ERA. Braden spent the first half of the 2008 season bouncing between Oakland and Sacramento, serving in a relief role while with the parent club. He worked his way into the rotation for the second half of the 2008 season and pitched well enough to keep the job into 2009. By this time he was strictly fastball-straight change, although he occasionally mixed in a modified screwball that found its movement through finger pressure rather than arm stress. Braden was throwing some of his best stuff at the start of the 2010 season when a walk-by incident landed him in the New York tabloids. The A’s were hosting the Yankees on April 22, 2010, when Robinson Cano popped a flare up the third-base line that was ruled foul. Baserunner Alex Rodriguez, who had rounded second and was nearing third, strolled across the pitcher’s mound as he headed back to first. The unprecedented trespass prompted Braden to howl, “Get off my $@*&#% mound!” and A-Rod’s shrug like it was no big deal further infuriated Braden. Braden continued jawing at Rodriguez after squeezing his glove to complete Cano’s 3-6-1 inning-ending double play. The fired-up pitcher chucked the ball into the dugout, kicked a stack of Gatorade cups, and slammed down his glove. The quote landed on the cover of the New York Daily News, and Braden was invited to deliver David Letterman’s Top 10 list of “thoughts that went through Dallas Braden’s mind while he threw his perfect game." Braden spotted enough well-placed changeups to finish out the inning and secure a win, but the shoulder problems persisted into the spring of 2011. Neither stretching nor anti-inflammatories provided much relief, and Braden made just three starts that season. When he walked off the Oakland mound in the fifth inning of his start on April 16, 2011, against Detroit, he knew he had thrown his last career pitch. Braden endured two additional surgeries before declaring his arm “a shredded mess” and retiring in January 2014.7 He joined ESPN as a Baseball Tonight studio analyst for the 2014 season and married actress Megan Barrick that November. They took up residence in the Los Angeles area. In 2015 Braden added in-game analyst to his ESPN résumé as the network signed him to a multi-year extension. That authenticity continued to endear him to the community of Stockton, where the Ports retired his number 50 jersey in 2015. Braden said he was ecstatic that his short career continued to let him make a living hanging around ballparks. 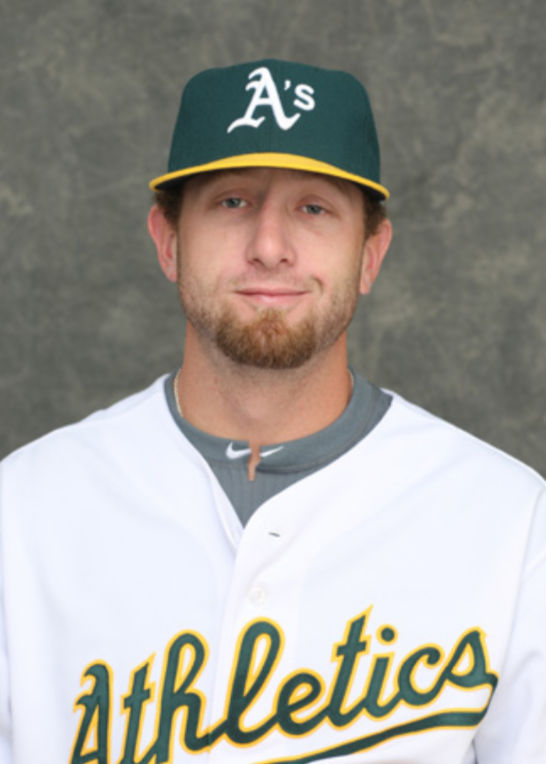 1 Author interview with Dallas Braden, January 5, 2016. All quotations in this biography are taken from this interview unless otherwise noted. 2 Jagdip Dhillon, “Braden enthralls hometown crowd with shutout,” Recordnet.com, recordnet.com/article/20050512/A_SPORTS/305129920, accessed January 26, 2016. 3 Susan Slusser, “Braden throws 19th perfect game,” SF Gate, sfgate.com/sports/article/Braden-throws-19th-perfect-game-3264978.php, accessed January 26, 2016. 4 Thanks to Doug Jumelet, Head Baseball Coach at American River College. 5 Carl Steward, “Steward: 'Grandma Peggy' gets the final word on A's pitcher Dallas Braden, and on A-Rod,” Inside Bay Area, insidebayarea.com/ci_15052220, accessed January 25, 2016. 6 CBS, “Dallas Braden’s Top 10 on Letterman,” Youtube.com, youtu.be/Hx1sxa2dwws, accessed January 26, 2016. 7 Susan Slusser, “Ex-A’s pitcher Dallas Braden says he is hanging it up,” SF Gate,blog.sfgate.com/athletics/2014/01/14/ex-as-pitcher-dallas-braden-says-he-is-hanging-it-up/. 8 Ben Cafardo, “ESPN reaches multi-year extension with MLB analyst Dallas Braden,” ESPN Front Row, espnfrontrow.com/2015/03/espn-reaches-multi-year-extension-mlb-analyst-dallas-braden/, accessed January 26, 2016.